1. To make the crumble: place all the ingredients into a food processor and mix until it forms a paste. Shape into a log then wrap in clingfilm and place in the freezer overnight. 2. Preheat the oven to 180ºC, gas mark 4. Once frozen, coarsley grate the paste (with a large grater) onto a baking tray lined with parchment paper. Return to the freezer until required. 3. 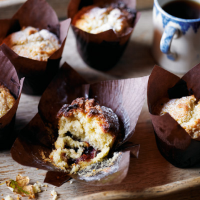 For the muffins: beat the butter and sugar together until smooth and creamy. Whisk in the eggs one at a time and add the milk, followed by the flour, almonds, cherries and both extracts. Mix together until fully combined. 4. Place 12 large The Cake Professional Muffin Cases into the muffin tray. Spoon half the mixture into the cases to fill halfway up. Spoon ½ tsp of the preserve in the centre then spoon on the remaining muffin mix. 5. Sprinkle the frozen crumble on top and then place in the preheated oven and bake for about 35–40 minutes. Dust with icing sugar as they come out of the oven. This recipe was first published in Tue Oct 23 13:12:00 BST 2012.